You will not believe the sounds of the "Roaring Waters" when you arrive at this cabin! 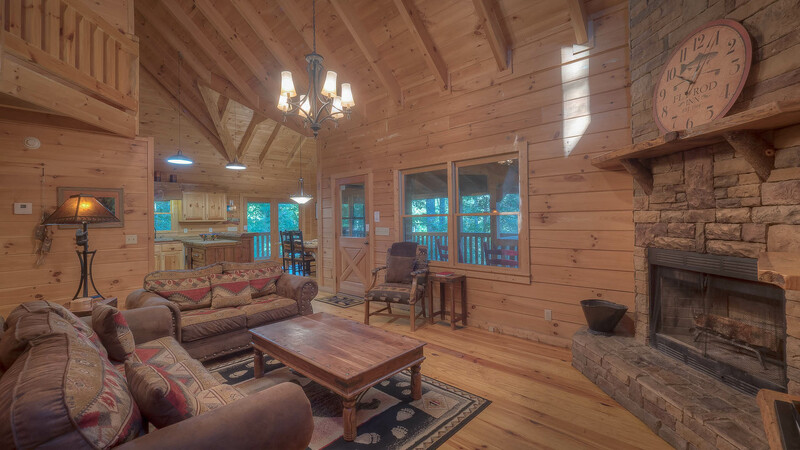 The sounds of Fightingtown Creek are ones that you will not forget, making this cabin a perfect destination for water lovers.Roaring Water Lodge is situated on a hill just above the creek and placed just so that you have views of both up stream and down stream. The cabin does feature a well thought out walk way to the creek bank, lit by vintage style street lamps and delivers you to a truly "park like" setting. 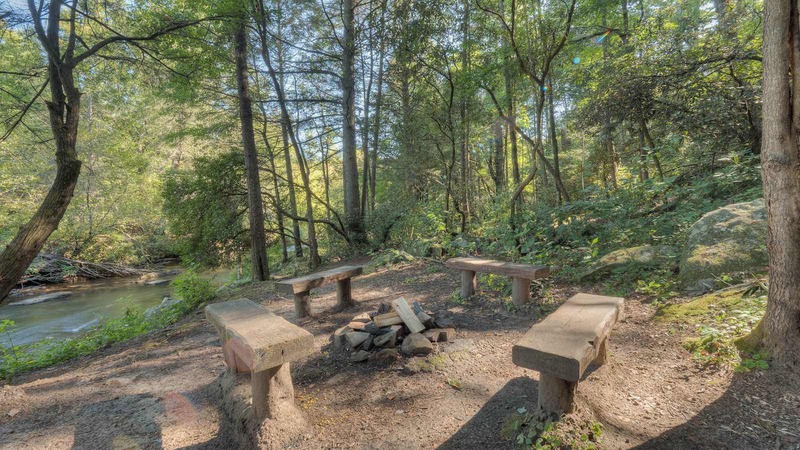 The park area adjoins the creek bank with a wood burning fire pit and log seating that is perfect for roasting marshmallows or just enjoying a warm fire. 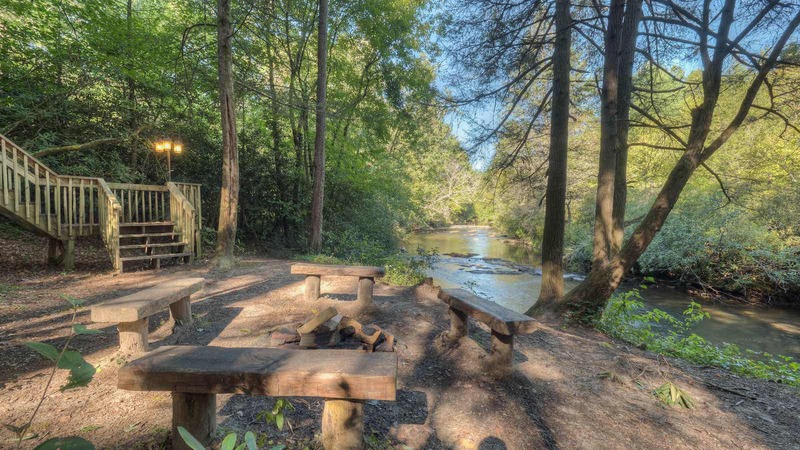 The fire pit is surronded by gorgeous mountain laurel trees and large natural rock formations (a unique amenity!) that will inspire the best night time stories. 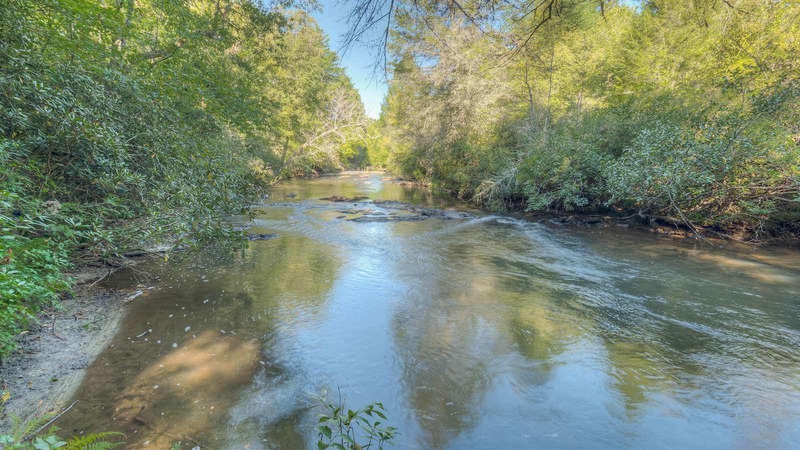 This area provides easy access to the creek for fishing, but remember the creek is very swift and riverlike! 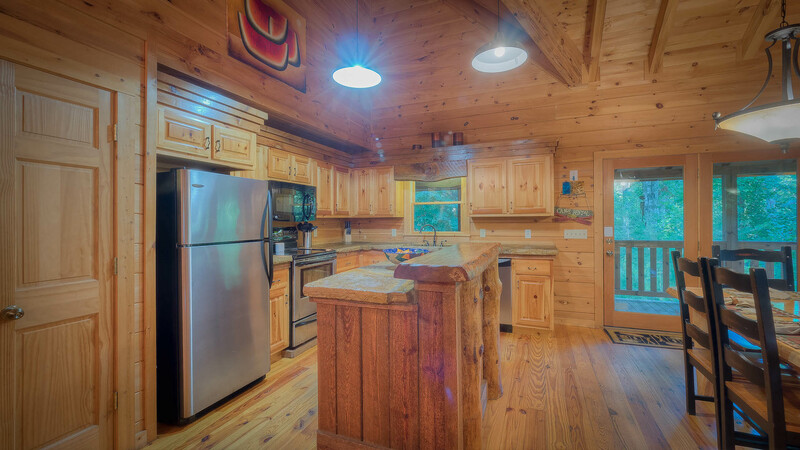 The main level of the cabin features a full wrap around covered porch complete with a propane grill and picnic table for outdoor dinners and rocking chairs for relaxation afterwards. You will also find a very special amenity on this level: a private screened porch with the hot tub, comfortable seating and a gas log fireplace making it a true outdoor oasis! Inside you will find the upgraded kitchen with stone and wood slab counter tops, stainless appliances, and dining area. The living space next to the kitchen is complete with a floor to ceiling stone fireplace with gas logs, flat panel TV with satellite and DVD player, and high end sofas. This level has two private bedrooms, one with a king size log bed and one with a queen size log bed. These two bedrooms share a full bath located just between. The upper level has one private bedroom with a king bed, flat panel TV with satellite, and full private bath. The open loft has two twin beds as well as a desk for convenience. The completed full basement level is all about fun! This level features a game room with pool table and air hockey table, a second living area with lots of comfortable seating, flat panel TV with satellite, stone fireplace with gas logs, and a bar for entertaining. You will also find a full bath on this level. You must see (and hear) this cabin in person! 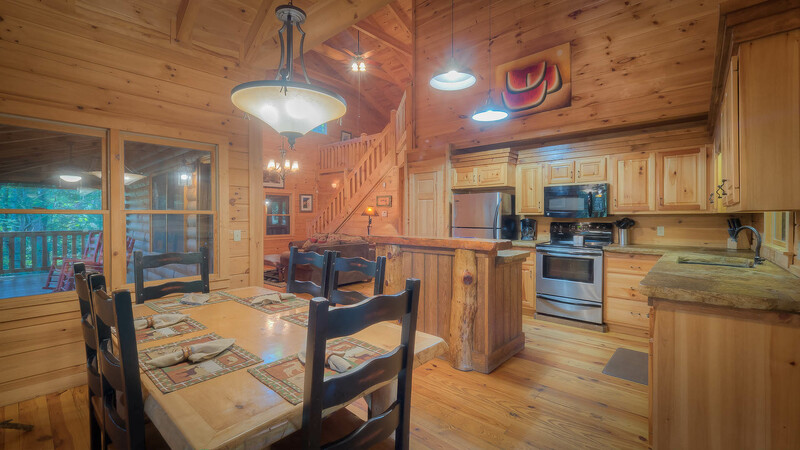 Roaring Waters Lodge is going to be the magical vacation spot you'll never want to leave! *Please keep in mind the cabin has a walk way down to the water from the cabin. The cabin is appromately 200 feet from the waters edge. This is also shown in the cabin's photos.